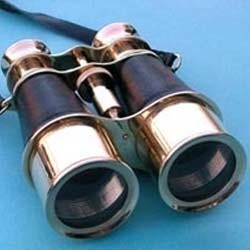 We have emerged as one of the leading organizations engaged in manufacturing, exporting and supplying excellent quality range of Antique Brass Binocular. This range is manufactured using supreme quality raw material and latest technology with the help of advanced manufacturing process. To meet various requirements of clients, we offer product in various specifications. In addition to this, our offered range is highly appreciated in the market due to features given below. Established in the year 1993, Bharat Engineering Company is a prominent Manufacturer, Exporter and Supplier of a wide assortment of products which are used in various industries. We are led by the CEO Mr. M. Hasan who, with his sharp intellect and dynamic approach has managed the firm in a proficient way. He has been a key person who has guided us to become a successful organization. The company is located at Roorkee, Uttarakhand, India. We are supported by a modern infrastructure which is vast and includes latest amenities. Our manufacturing unit is spread across a large area and is equipped with the hi-tech machines and equipment required for quality large scale production. Our machines are up-graded from time to time to ensure flawless functioning. We are backed by a strong team which is comprised of diligent professionals. These individuals have rich industry experience and are well versed with the complexities associated with the production process. Our team is trained at regular basis to keep it at par with the cut throat market competition.